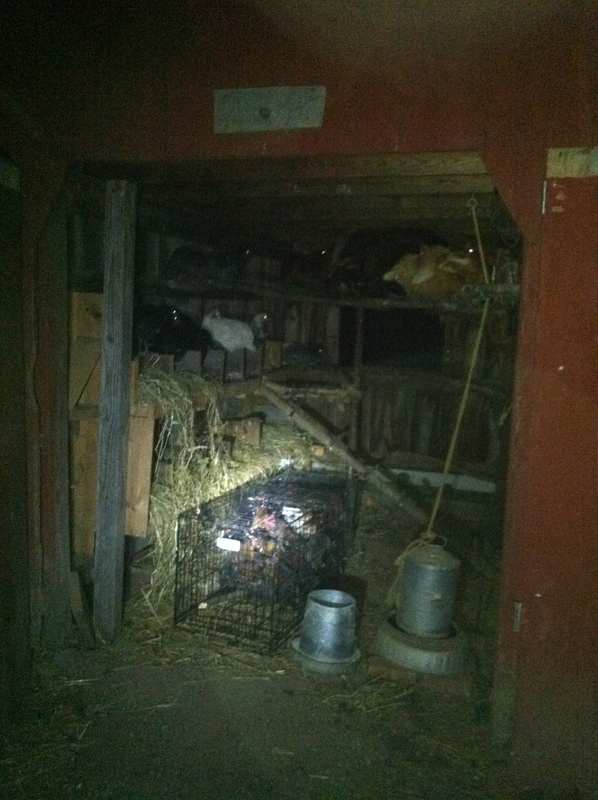 This is how the coop looked last night when we closed up the chickens. 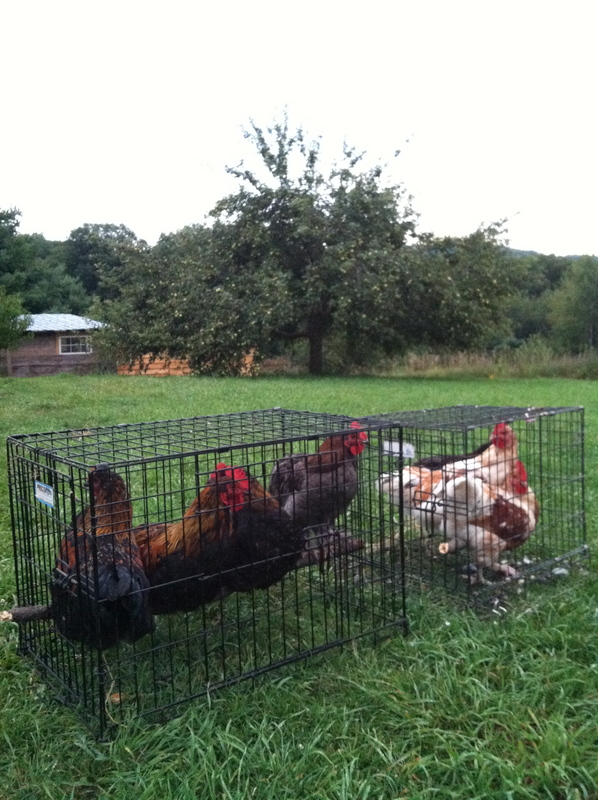 We let them go in and roost and, once they were settled, we grabbed the seven roosters slated for culling and crated them. If you ever need to move a chicken, it is advisable to do it at night. They are calmer and less on-guard. You won’t have to chase them; you can just pick them up and move them. We left them in the crates overnight to make the morning’s processing go more smoothly. When trying to determine the right timing for culling roosters, it is best to pay attention to their behavior. As soon as they start to crow, you know you are getting close. Some people wait a month after they hear the first crow; we waited until the roosters were acting like such assholes we couldn’t put up with their nonsense anymore. They’d begun harassing the hens and making a general nuisance of themselves. We were happy to see them go. 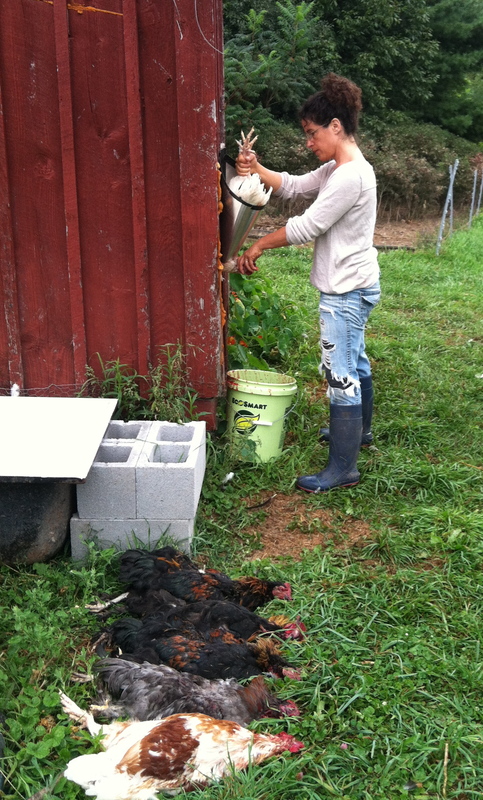 Once the morning chores were done, we were ready to start the process of culling the roosters. Having never done this before, we’d read a great deal about how to have the experience go smoothly for all involved and felt we were ready. We felt pretty strongly that the other chickens would be oblivious to what we were doing, but moved the processing setup out of their direct line of vision anyway. Having them crated and waiting in the morning was really great. We’d made our kill cones (see Part One of this blog post), and had fashioned some flat pieces of wood into a striking mallet for knocking the chickens out before cutting their throats. While a quick cut to the jugular is considered a very humane way to kill a chicken, it doesn’t change the fact that the bird is still bleeding to death. We felt that to render each bird unconscious prior to the cut was the right thing to do. The striking implement was simply some scrap wood nailed together to weight it more heavily at one end. 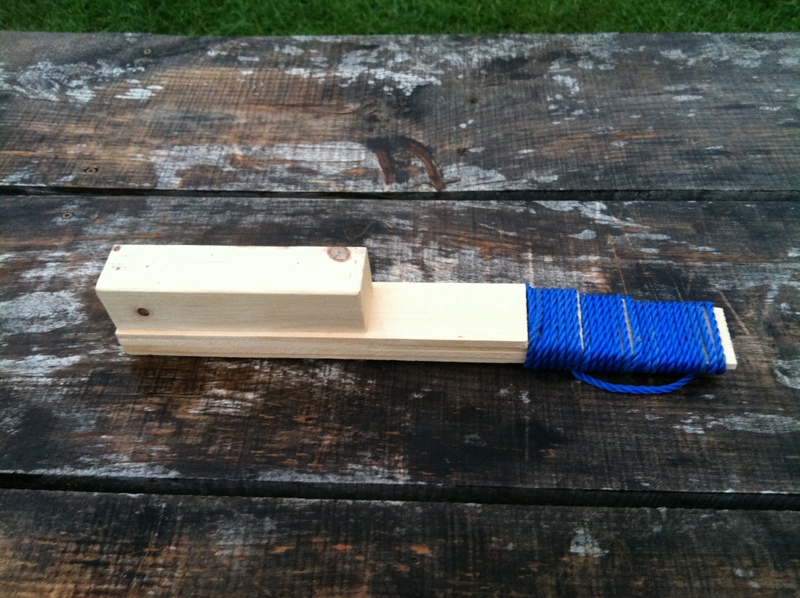 The other end was wrapped with nylon string to give the striker a comfortable place to grip and avoid slipping. This worked very well. The hard part for me was actually hitting the bird hard enough to knock it out. I failed at my first attempt and ended up having to chase a pretty angry rooster around the yard until we were able to catch it and try again. This experience was enough to make me decide that perhaps I was more of a cutter than a striker. Dave and I traded jobs and had no trouble from that point forward. In an assembly line that would have made Henry Ford proud, we processed the roosters one by one. Dave struck and coned, I cut and bled. The cutting is actually quite simple, but then you have to hold on to the bird’s feet until the bleeding is complete, as there is a fair amount of movement until that point. Once all the birds were killed, we were ready to start the process of cleaning them, inside and out. I volunteered to do the out. Because these birds are destined to be chicken soup, we elected not to pluck them. We set up a station of sorts, hanging the birds from their feet to be able to free them from their skin and feathers without too much effort. Having removed the skin, crop, and feathers completely, the bird was then taken down and sent over to Dave to be eviscerated and washed. By the time he was finished, all seven birds were completely clean and ready to bag for the freezer, awaiting the day when we make them into soup. The last stage of this process was disposing of all the blood, feathers, heads, feet, and internal organs. Because these were not pieces we wished to use, we decided to introduce this material into our compost pile. 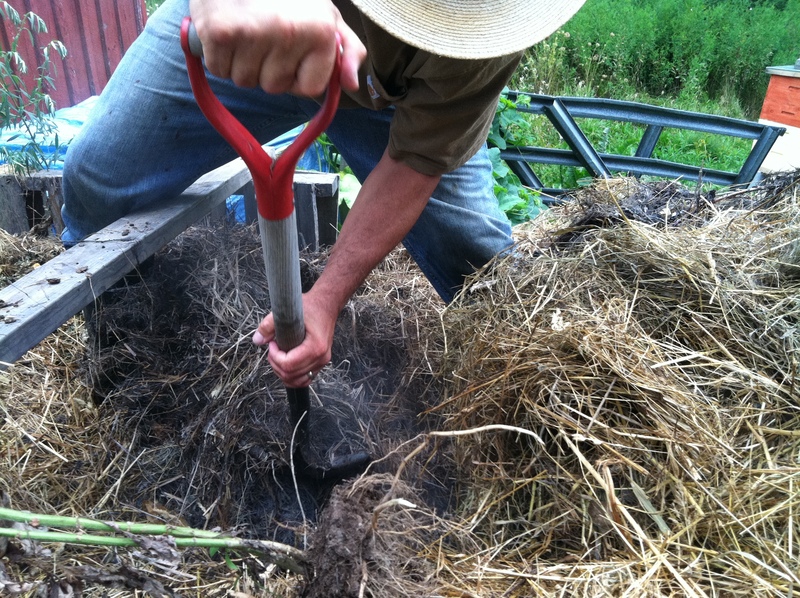 Our compost is so hot right now, even just shoveling it out a little lets off a huge amount of steam. We dug down into the very heart of the compost and dumped all the poultry material in there. We covered it well to keep other animals from nosing around and will let the heat of the pile work its magic. When we were completely cleaned up and the birds were in the freezer, it was 9:00 a.m. We stood back and were fairly amazed at what we’d just done. 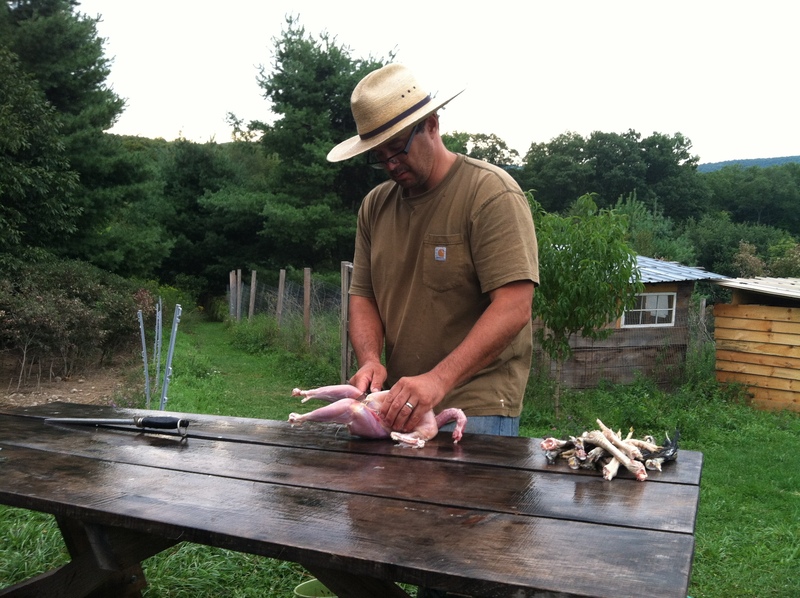 By culling these roosters, we’d solved three issues at once: 1) the roosters would no longer harass the hens, 2) they would no longer eat huge amounts of feed and corn and cost us a small fortune, and 3) we now have the start for six pots of chicken soup. So, applewood farm is now down to 48 chickens. Hopefully, we will start to collect more than seven eggs a day. Sigh. This entry was posted in Uncategorized and tagged applewood farm, chicken coop, chicken soup, compost, coop, crow, culling, evisceration, feathers, hens, kill cone, killing, roost, roosters. Bookmark the permalink. Hey! how you doing! We are willing to do free labor for a week or so at your farm. Seriously, we would love to learn. Thanks for the note! We are doing well. Thanks so much for the offer, but it’s not really that kind of farm. It’s a little two-acre plot that includes our home. As much as we wish we could have help (! ), there just aren’t facilities for people to stay in. Love that you guys are reading the blog! Hope you are well. This was one of my all-time favorite blogposts by you. I laughed out loud at the line, “Some people wait a month after they hear the first crow; we waited until the roosters were acting like such assholes we couldn’t put up with their nonsense anymore.” Thanks for the smile. The striking implement sounds like a good idea. I’ve just been putting them in the cone and cutting their heads off. It’s difficult to do by myself, since I have to use my left hand to hold the rooster’s feet to keep him from kicking out of the cone. It would be much easier, and probably more humane, if they were unconscious. I’m hoping you’re still blogging! I’m just reading this as we have our first lot of chicks hatched. I believe two are roosters, two hens. They are currently 9w old. This morning I heard from Roast ( one suspected roo ) the unmistakable first crow sound. Now our plan had always been to process the boys. I’m still ok with that…but 9w seems so little! How long do I have for him to still be edible….we were planning on grilling him or roasting him ( as so named…his brother has been called tandoori by my eager children lol ). Any tips on this would be greatly appreciated! 9 weeks is definitely too young to cull if you want any worthwhile meat. That being said, are these layers or roasters? Different breeds have different purposes and if your birds are layers, the roosters will never have enough meat on them (at any age) to be more than the base for a nice pot of soup. If they are roasters, then you should ideally cull them between 12 and 14 weeks for the most meat before it becomes tough. Oh thank you for the super fast reply!! He is a light Sussex so he is a dual purpose bird. We have another, full grown LS layer called whitey, and she is HUGE! And has the best personality. We’ve also heard they make good eating. So it should be OK to leave him another month or so before we cull him? We are suburban dwellers, so really shouldn’t have a rooster here at all ( but our neighbours are very easy going, and tbh, my homeschooled kids are way noisier than any rooster! ). Thanks again for your reply. I’m just reading old posts of your blog. I like it!